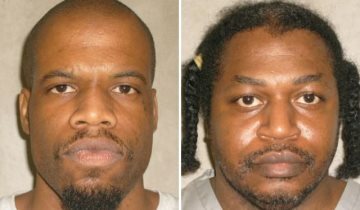 AFRICANGLOBE – The Oklahoma Supreme Court ruled late Wednesday that two death row inmates are not entitled to know the source of the drugs that will be used to kill them. In rejecting the inmates’ claims, the court also lifted a stay of execution that it had granted earlier in the week in a case that placed Oklahoma’s two highest courts at odds and prompted calls for impeaching justices on the Supreme Court. Wednesday’s decision paves the way for death row inmates Clayton Lockett and Charles Warner to receive a lethal injection at the Oklahoma State Penitentiary in McAlester. A stay issued on Tuesday by Gov. Mary Fallin remains in place for Lockett, but only until April 29, the same day Warner is scheduled to die. Fallin spokesman Alex Weintz has said the governor is still reviewing the court’s ruling and has not made a decision on what she will do. Weintz has said it is possible both men could be executed on April 29. Telephone message left late Wednesday with attorneys for Warner and Lockett were not immediately returned. States that have the death penalty have been scrambling for substitute drugs or new sources for drugs after major drugmakers — many based in Europe with longtime opposition to the death penalty — stopped selling to prisons and corrections departments. Oklahoma isn’t the only state where the secrecy of execution drugs has been an issue. Courts in Missouri and Texas have rejected claims that secretive death-row procedures could expose inmates to painful executions. However, the Oklahoma inmates asked their question in a civil court, not a criminal one. The nine-member Oklahoma Supreme Court caused an uproar Monday when it issued a 5-4 opinion that delayed the executions until the inmates’ claims over drug-source secrecy were handled. The justices are restricted to ruling on civil matters. But the Oklahoma Court of Criminal Appeals, which handles cases from inmates, said it wasn’t authorized to weigh in on the request for a stay because the inmates challenged the execution procedures in civil court, not criminal. On Wednesday, the justices reversed a lower court decision that said preventing the inmates from seeking information about the drugs used in lethal injections violated their rights under the state constitution. The high court said the inmates’ constitutional rights weren’t violated by keeping the drug sources secret. Courts in Missouri and Texas have rejected claims that secretive death-row procedures could expose inmates to painful executions.